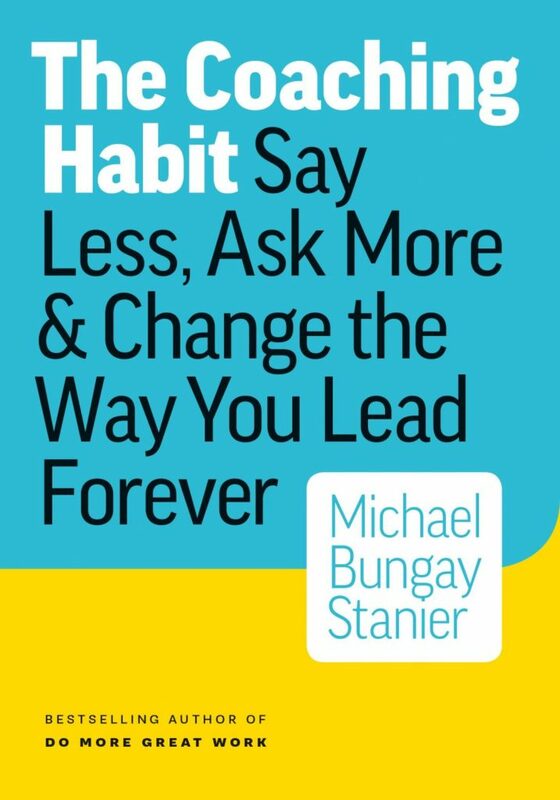 The Coaching Habit by Michael Bungay Stanier is either really good or aggressively mediocre, depending what else you’ve already read. The book is aimed at helping managers and small business owners stop being the deus ex machina. The god in the machine. The one who comes to the rescue and magically solves the problem. The goal here is to change conversational habits so that managers are ‘coaching’ people through the problem, instead of just solving it for them. So that comes in the form of 7 questions, posed at key junctions in a conversation. The Kickstart Question – “What’s on your mind?” – The idea is to make people feel your openness, but also to invite them to do the talking. “What’s on your mind” is a better opener that “what do you want”. The AWE Question – “And what else?” – The problem people have is often not the real problem. They probably know what the real problem is, and if they just keep talking they’ll eventually find it. “And what else” keeps them talking until they do. The Focus Question – Questions That Start with What Instead of Why – “Why” questions are dead ends that often lead to blame or conflict. “What” questions are open ended, and invite people to find a solution of their own. “What were you hoping for” instead of “why did you do that?”. The Foundation Question – “What do we want?” – Adult relationships are ones where you are “able to ask for what you want, knowing that the answer may be No.” The idea is to find out what the actual, specific request is, and make your own desire known. The Strategic Question – “If you’re saying yes to this, what are you saying no to?” – The intention is to make people think about what the conclusions of a conversation with you is bringing them to and forces them to think about any larger commitments that come with it. The Learning Question – “What was most useful for you?” – When a conversation diffuses a person’s needs, finding out what and why improves future conversations with this person and with others. These are all decidedly good questions for anyone who finds themselves in the position of a manager. If that’s you, you’ll definitely relate to some of what’s said here. If you’re in the habit of coming to the rescue, employees will chip away and start coming to you with less and less thought. That’s, without a doubt, a real productivity problem. And this series of questions, either in part or in its entirety, will almost certainly help direct your team to more reflection before getting you involved. However, If you’re being a good manager and doing your reading, you’re going to wish this book was just a blog post because most of the explanatory text has already been beaten to death elsewhere. If you’ve read almost any other book about psychology in the workplace, simply reading the question without any explanation is probably enough to get the necessary take away. Likewise with books about habit forming, The Coaching Habit will seem painfully redundant. My criticism of the book, however, is not really the content itself. Especially if the topic is new to you. My criticism is about the structure and styling of the book’s pages. There are 8 sections, and 9 chapters. So each section has 1 chapter, except 1 section, which has 2 chapters. The sections have a brief preface, followed by the chapter, which are each maybe 9 or 10 pages. So the “sections” are arbitrary, and almost like Stanier just couldn’t pick a chapter title, and decided to nest each “chapter” inside another “chapter”. What? I don’t know either. The section prefaces are so short, why not just roll them into the chapter? The chapters are so short, why not just roll them into an essay? These are perhaps little more than pet peeves, but there is some clue to these questions smack-dab in the middle of the book. Stanier flat-out asks for reviews on amazon. Sure, there’s nothing wrong with that, besides it seeming kind of hacky and unprofessional. But each chapter ends with a short section “From the Box of Crayons Lab”, which tries to give some scientific explanation for the preceding advice. Box of Crayons, as you might guess, is Stanier’s coaching company. Again, there’s nothing wrong with that, per se. I just have some aversion to paying to read a long-form advertisement. And that is largely what The Coaching Habit felt like; like some good content strung together by pagemaker gimmicks and padded with unnecessary sections and chapters to make it seem more like a “legitimate” book when seen from the index. It takes whatever authority the book had down a notch. And why do you read non-fiction books if not for the authority they espouse? I didn’t hate the book, but it wasn’t for me. There weren’t any new ideas in there, and I think Stanier’s digital marketing team has been given too much leeway. I didn’t leave feeling like Stanier wanted to teach me something, I left feeling like he wanted to sell me something, which is annoying, because he already did when I bought the book.